Several times each day, I’m talking about search with a client, a teammate or a friend. I spend hours every week giving free SEO advice and helping people rank in search engines. Giving away my best SEO advice is a big part of my job. And I love it. But if you sat through a few hundred of these meetings and presentations you’d be bored out of your mind. Not because the topic is boring. It’s not. But the advice is often the same. Here is the roundup of our best SEO tips and tricks. I’ve given these tips hundreds of times because they are the most valuable to most people, especially for beginners and small businesses. Here are the top three. Understand this and you’ll see huge opportunities in your website’s structure. There are all kinds of opportunities to rank. 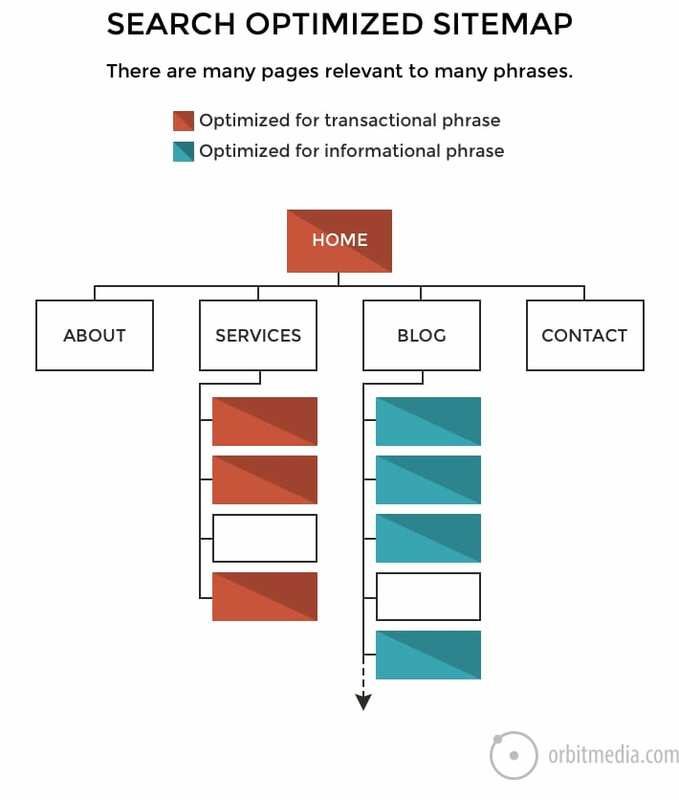 Success depends on making a keyword-focused sitemap with many pages targeting many phrases. Keep in mind, there are two kinds of keyphrases. Never make a services page with all of your services listed in one spot. Or if you do, make sure you also make a page for each service you offer. Optimize each for the name of the specific service. Make a page for each team member. These pages have a chance to rank for each person’s name. Outrank their social media profiles and you’ll get a bit of traffic to each of these bio pages forever. How many times does it appear on the page? Just once? How is it used? Is it in the header and in the body text? Or is it just in the links? If you don’t see the phrase in the header or body text, you have a keyphrase frequency of zero. This answers the question as to why you’re not ranking. Mystery solved. You failed to indicate relevance in the basic ways. You failed to follow SEO best practices. Our goal is to convince Google that we made the best page on the internet for the topic. If you failed the control + F test, why would Google think this is a great page? 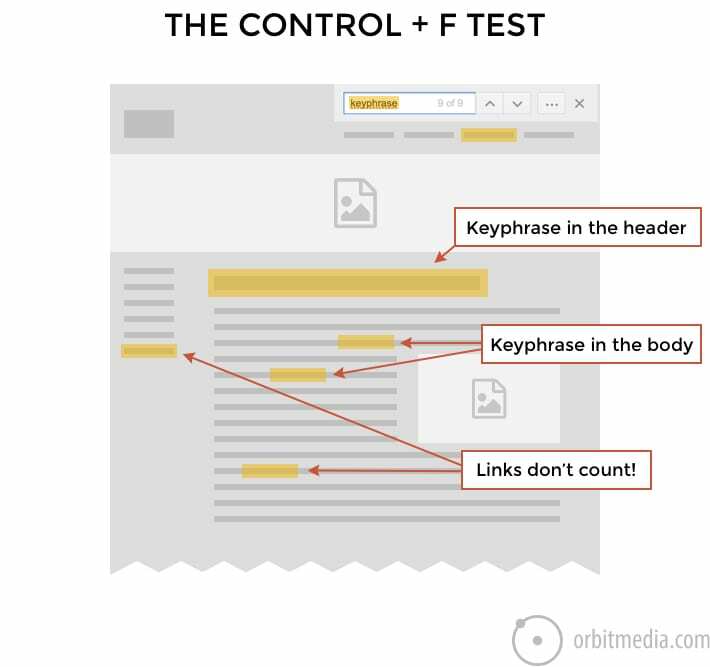 When counting the instances of a keyphrase, don’t count links or in navigation. Link text does not indicate the relevance of this page. Link text tells Google that another page is relevant for the phrase: the page the link is linking to. Although the title tag is the single most important piece of SEO real estate on the page, it’s in the code and not in the page itself. But of course, make sure the target phrase is in the title tag. No, this isn’t on the page either. But it’s an important place to indicate relevance. Along with the title, the meta description is often part of the “snippet” when the page ranks in search results. So make sure to use the target phrase here too. Sure. Use the phrase as the alt text of images. But don’t kid yourself. Alt text is not a major search ranking factor. Think about it: if you were the head of Google’s search team, would you make alt text an important ranking factor? Of course not. Indicate relevance by using the target phrase once in the title, header, meta description and body text. There is no magic number for keyphrase frequency. Make sure your page is detailed and thorough. The average high-ranking page is 1500 words. Give it some heft. To rank, you need authority. To have authority, you need links. To get links, you must be visible with people who create content. Therefore to rank, you need relationships. It’s a little different (and a lot more fun) than the “link building” mentality. 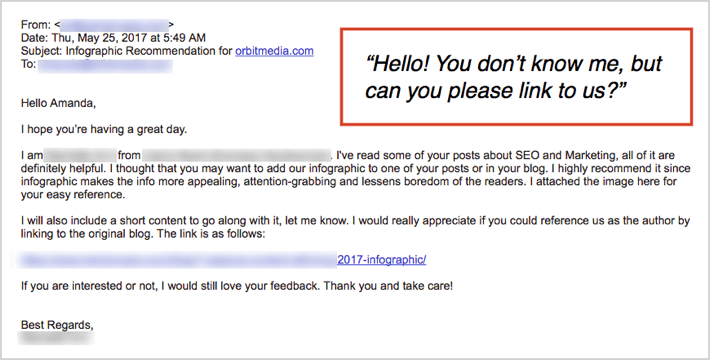 A lot of SEOs still pitch their content by sending cold emails to bloggers asking for links. Here’s what those emails look like. We get them many times per day. Sad, isn’t it? There is no connection, no relationship and in the end, no results. So rather than building links, build relationships with like-minded content creators. Make friends with bloggers and collaborate on mini-content projects. 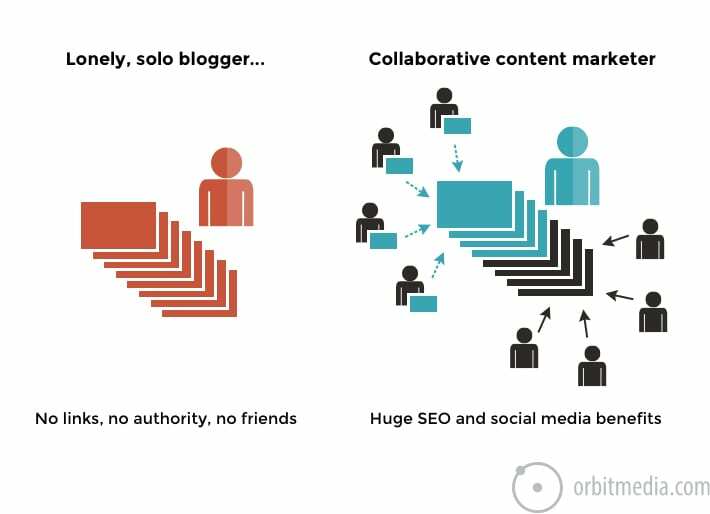 Notice the difference between a solo blogger and a collaborative content marketer. But you’re not looking for just any “social media influencer.” You’re looking specifically for content creators. The One Percent Rule states that only a tiny fraction of people within any online community actually create content. The other 99% of users consume or contribute to content, but do not create. Therefore, our goal is to connect with and collaborate with that 1% of users, the content creators. It’s those relationships with content creators that will give you a long-term, durable advantage in search. Once you have a network filled with like-minded creators, you’re halfway to winning a link. Now you just need something worth linking to. This is a key tip for beginners and experts alike: don’t build links, attract links naturally by making great things together with people who make content and links. Use social media to find content creators in your niche. If you need a few tips on how to use social networks like a giant phone book, you can find them here. Next, connect with them through lots of little interactions. Share, comment and gradually make some friends. You can find step-by-step instructions here. Finally, reach out and ask for contributor quote, interview them and find any excuse to collaborate on content marketing projects. When someone is looking for me, what would they search for? This should put you in the mindset for search and keep you focused on empathy and quality. Those are the two fundamental principles in search engine optimization. Happy ranking! 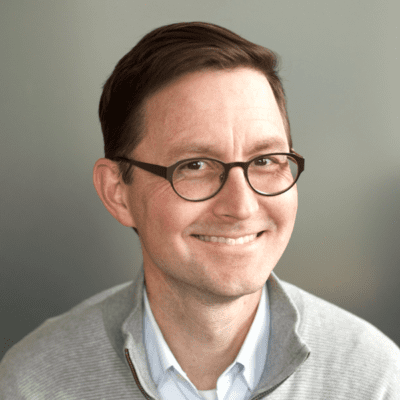 Colophon: This article was optimized to rank for “free SEO advice.” It uses many of the semantically connected phrases including tips, tricks, best, Google, for beginners, for small businesses and expert. It is 1,200 words long, includes five images, one video and one contributor quote. Later we’ll see how well it performed in search! About your tip on creating targeted sitemaps, I use yoast sitemaps which has two things, the page sitemap and the post sitemap (all posts from day1 linked here). How do I categorize them into different keyword focused sitemaps? Great tips, especially the third one – building a strong network within your niche is the best way to make your website known. Yes, networking and relationships are super important. It’s also much more fun than doing everything alone. This is one of the reasons that I love live events. Thanks for the comment, Andrea! Love seeing you in our comments. I love the colophon too! Full disclosure: I had to Google it because I didn’t know what it was….sigh….but now I do and I thought it was brilliant. Great post Andy, as always. For all you reading Andy’s stuff for the first time, this methodology works! I’d be interested in hearing your reaction to Swadhin’s question. I’ve been experimenting with sitemaps I can manipulate, but I’d love to see a post or hear from you on this topic. Be interested to hear your organizational methodology for keeping this huge universe of keywords straight. Colophon: The first paragraph of this comment was written based on actual results from Winbound comments, not because Andy has bought me a beer in the past. But I am thankful he did, and encourage him to buy me more in the future. Ha! All comments hence forth will require a colophon, Greg. Great advice. I’ve recently been put into a position where I’ll be needing to learn SEO and linking and your blog has been SOO helpful in giving me a place to start. I love your colophon section! I’m thinking I should come work for you! I like the idea of networking rather than sending cold emails (even if some marketers state about its effectiveness). I think it also depends in what market you are as well and what sell and who is your audience. But everybody likes networking. Every likes compliments on their work and asking for their expert advice. If someone would contact me for my advice I would to share what I know. I guess the problem is that giving expert advice require experience, knowledge and skills. It takes time to acquire these abilities. Once you are a skilled master in a niche people will ask for help naturally. Straightforward commonsense. I get those emails from link seekers too. Naturally, I don’t respond. But I’d like to tell them the truth: I hate Infographics!